Consistent logic has never been a liberal strongpoint, and the current controversy over the judge in the Trump University lawsuits is making that clearer than ever. Democrats and left-loving media pundits in an uproar over Donald Trump’s criticism of the Hispanic judge overseeing legal action against the presumptive Republican presidential nominee are conveniently forgetting their own history when it comes to judicial appointments — and Hispanic judges. As Iowa Sen. Chuck Grassley pointed out in an interview Wednesday, one of the Supreme Court justices appointed by progressive hero Barack Obama has said pretty much the same thing Trump is saying now — but liberals lapped it up. 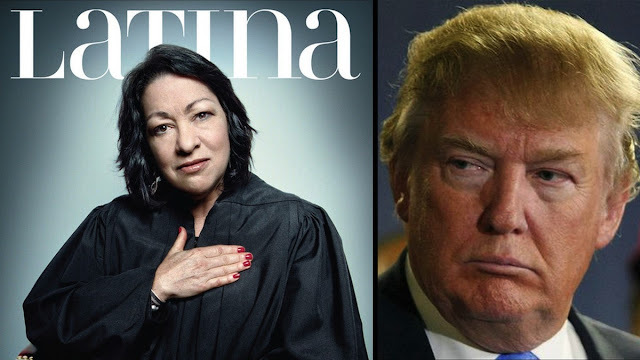 Speaking with his home state paper, the Des Moines Register, the veteran Republican and chairman of the Senate Judiciary Committee noted that Trump’s criticism of District Judge Gonzalo Curiel for allegedly allowing his Mexican heritage to color his rulings in the Trump University lawsuits was really not much different from an argument then-U.S. Appeals Court Judge Sonya Sotomayor made for years about the approach a Hispanic woman takes to the judicial job. In numerous formal speeches prior to her appointment to the high court in 2009, Sotomayor spoke about the superior wisdom her ethnic heritage had bestowed upon her when it comes to matters of law and making sure justice is served. That, Grassley said, was not logically different from Trump’s claim that Judge Curiel was allowing his Mexican heritage to influence his legal judgments. Actually, there was a fair amount of criticism at the time, it just wasn’t from the same liberal politicians who are leading the criticism of Trump today. Former House Speaker Newt Gingrich, for instance, put it plainly when he called Sotomayor’s “wise Latina” observation naked racism, according to Politico. Unfortunately, Grassley backed away from his comments later Wednesday — possibly under pressure for using pure logic in a political discussion — but that doesn’t change the validity of the point. In fact, it had already been brought up by, among others, Eric Bolling on Fox News’ “The Five,” and National Review’sVictor Davis Hanson. Liberals loved it when a “wise Latina” like Sotomayor bragged about how her heritage could allow her to reach a “better conclusion” than a white male on a point of law — stating it as a matter of common sense. When Trump makes virtually the same argument, he’s not hailed as a “wise Anglo,” he’s branded as a racist. Gingrich, to his credit, slammed both Sotomayor in 2009 and Trump’s statements about Curiel this week. Liberals should try the same consistency some time. Conservatives on social media had a field day with the comparison, while liberals said there was absolutely no equivalence between the two. That’s what they always say when they’re contradicting themselves.
.@TheWorldsFrates @DailyCaller Oh surprise! Could this be what Trump was referring to. We think so. You be the judge. Libs don’t think it’s lying. They just call it interpreting the same facts differently.